Obsessilicious posted this picture a couple of months ago and it immediately caught my attention. I've still not forgotten about it so have posted it here as a kind of inspiration. 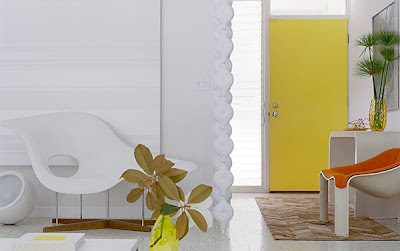 I've tried searching for more pictures of yellow interior doors but couldn't find any that were really 'my style'. I did a post on orange doors last year so now my 'future house wishlist' includes an orange front door and a yellow door somewhere inside. The 'bubbly' yellow vase is cool too - especially next to that funky chair. I love the color! I wouldn't have thought to paint an interior door bright yellow but it really works.